I melt them by continuing to eat this chili. I’d like to begin this morning by wishing a very Happy Birthday to Solus. Be sure to wish him one as well. Yesterday turned into a snow day. After work got cancelled, I decided to have a little lie down for a few minutes. You know, just rest my eyes. I don’t recover as fast as I used to. Which is really hard given the workouts and the printing and the working. It is also stupid. You’d think that given my healthier eating habits, my stupid push-ups, and my new gallon-a-day water routine, I’d feel better. I went places and did stuff all weekend. No rest there. So, I took a rest day. I did as little as possible. I just sat around, baked cookies, and sat around and ate a few of the cookies I had baked. Seriously, I only ate 3. Of the 45. I was impressed with my self control. 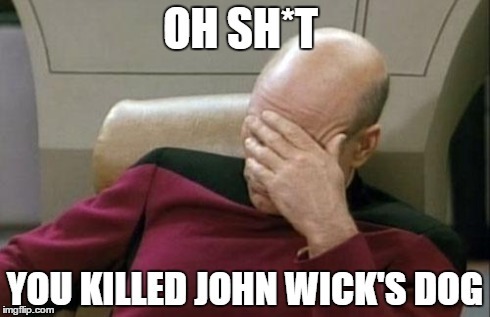 I also watched John Wick. You know, the Keanu Reeves movie no one knew about that has a ridiculous amount of awesome actors in it. It was just as good as I had heard it was. I halfway expected it to be a trick. Like my friends all got duped into paying a nickel to see a man eating chicken instead of a man-eating chicken. Because they got duped, they thought it would be funny to dupe their friends too. Anyway, it was really good. Go watch it. As for today, workout got cancelled due to road conditions. I assume they are slippy. The roads, that is. Not the conditions. Depending on how I feel once I get some coffee flowing through my veins, I might head over to my studio to work for a bit. In regards to your tiredness, there is such a thing as overtraining. I should’ve said: do you think you’re overtraining? I think is is more of a case of I’m undersleeping than I am overtraining.